For other uses, see Street people (disambiguation). Bronze statue of José María López Lledín known as "El Caballero de Paris" in Havana, Cuba, by sculptor Jose Villa Soberon. Unlike the nearby statue of St. Francis, this statue stands simply on the sidewalk and is a popular tourist attraction. The statue's beard has been polished by the hands of people standing to be photographed with it, for luck. Street people are people who live a public life on the streets of a city. Street people are frequently homeless, sometimes mentally ill, and often have a transient lifestyle. Certain neighborhoods, especially those in neighborhoods near universities, such as Telegraph Avenue in Berkeley, California, The Ave in Seattle, Washington, or the Pearl Street Mall in Boulder, Colorado often host street people. They may also frequent bohemian commercial districts such as Colfax Avenue in Denver. Individual street people may be familiar figures to the entire community. 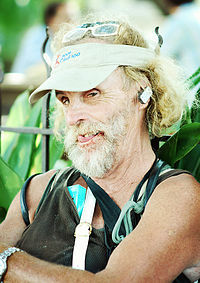 Examples of well-known street people are José María López Lledín who lived a public life on the streets of Havana during the 1950s, Mr. Butch of Boston, Leslie Cochran of Austin, Juan of Seattle, or Louis Thomas Hardin ("Moondog") who was a street musician, inventor, and later homeless person in the 1940s through to 1970s in New York City. Contemporary street people in the United States include hippies, some of whom may be beggars who often ask for spare change on the streets; bag ladies who often have all their possessions in a shopping cart which accompanies them. They also may include street performers, and people with chronic mental illness. The term street people is used somewhat loosely and may be used simply to refer to eccentric people who live in Bohemian neighborhoods. However, the defining characteristic is time spent in the street, wandering the streets for a substantial portion of their day or night. This street presence combined with their distinctive disheveled appearance, result in some individuals becoming familiar to residents of the neighborhood they frequent. Street people are said to have an unwritten code or set of rules that govern interaction between street people. Referred to as the "Code of the Road" it emerged from the Hobo camps of the depression era to encompass urban street people. The "Code of the Road" was detailed in Xploited Magazine. Poor economic and social conditions can result in accumulations of the homeless, often called street people, in certain neighborhoods. This may result in revival of vagrancy laws, or similar laws which may prohibit lying or sitting on the street. Results and attitudes vary, especially as liberal communities attempt to grapple with large numbers of the homeless. Post traumatic stress disorder experienced by homeless veterans and sexual abuse victims. ^ The Boxman (April 2009). "Code of the Road". Xploited magazine. Archived from the original on 18 July 2011. The Rabble of Downtown Toronto by cartoonist Jason Kieffer, "notable street people in Toronto, himself included".